BULLDOG STANDARD USEFUL INFORMATION F.A.Q. Before purchasing your Bulldog, you must think about the personality and characteristics of this breed to determine if this is the dog that you want to join your family. These questions below I have been asked quite frequently, I hope they will answer some of your questions! What is the average life span of a Bulldog? The average life span for a Bulldog is about 8 to 12 years. Oh Boy and how!! :) That is due to their short breathing passage. They do snore and sometimes very loudly! Are Bulldogs good with children? Bulldogs love children! They are very patient and tolerant with children, they are gentle and loving dogs. As with any breed when the puppy is brought home, the children must be taught how to socialize with a puppy how to pick him up and hold him properly, just as they would be taught with a new baby brother or sister. No child should ever be left unsupervised with ANY dog because children many times do not understand the proper way of handling a puppy. Like no other breed the placid and trustworthy Bulldog will tolerate poling and prodding by the children without becoming annoyed. The bulldog, needs to be taught how to treat his new young family members, just as the kids must be taught how to treat their bulldog. They cannot ride on his back (yes I have seen horrified pictures on the web of children doing so- the dog is not a horse and his back is not strong enough to carry a child, this will end in back problems) , they cannot pick him up and drop him, pull his ears or otherwise handle him roughly. This is very individual from dog to dog but in general no, they are not great barkers. Are Bulldogs good with other animals? Based on my experience I would say yes, but of course this is very individual to each Bulldog. It can happen that their jealous nature can lead to fallings out between dogs within the same household and they can be possessive of toys and food. 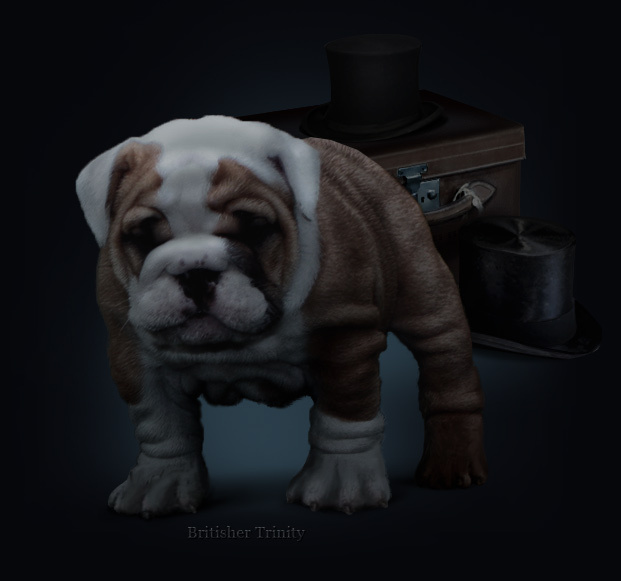 Will a Bulldog make a good guard dog? If this is what you are looking for, you may want to consider another breed, like the Doberman or Rottweiler. Their tails are so short, are they cropped? No. They are not cropped, they are born with short tails. How about his grooming needs? Although overall grooming is minimal for this breed, a Bulldog will need to have his coat brushed on a regular basis and have his toenails trimmed. Have ears and eyes and his wrinkles cleaned on a daily basis. What is a Brachycephalic breed? A Bulldog is a Brachycephalic breed. This means they have flat faces, wide heads and pushed-in noses. As mentioned above they must have the folds of skin around their eyes and noses cleaned, often on a daily basis. In addition, they are quite susceptible to heat exhaustion and heat stroke and must not be allowed too much time outdoors in heat and humidity. Make sure to keep your Bulldog out of the heat and the extreme cold. DO NOT LEAVE your dog in a car unattended, EVER! On a hot Summer day- avoid the heat of the day and take caution when exercising your Bulldog and not let them overheat. If your Bulldog starts to overheat, hose them down with cool water, use wet towels and calm him down. Your dog will be around for a while so make your choice wisely, you are responsible for your new member of the family. Your new family member will need food, love and veterinary care. You should also have a fence in the garden to prevent your Bulldog from being hit by a car. Keep your Bulldog on a lead, they can very quickly change their minds and be off after something across the street and we don't even want to think of the consequences. The website has got a make over and a new layout, please do enjoy your stay! Think twice before you copy anything from this website. Registered with the IP Rights Office Copyright Registration Service Ref: 975030123.